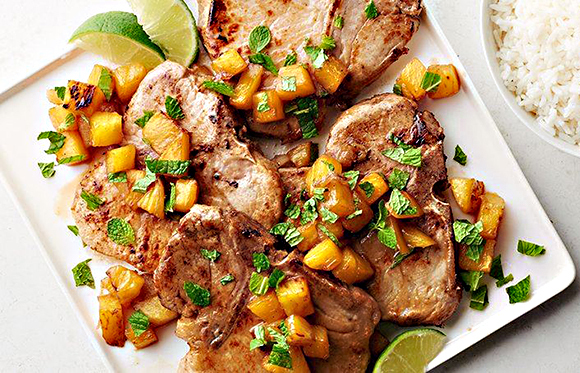 Put a little Cuban spin on your pork chops with this fun cocktail-inspired skillet supper. Rub pork chops with salt and pepper. In non-stick skillet, melt 2 tablespoons of the butter over medium-high heat. Add pork; cook 3 to 4 minutes or until browned on first side. Turn pork; reduce heat to medium, and cook 2 to 3 minutes longer or until pork is no longer pink in center (at least ). Transfer to plate; cover with foil to keep warm. In same skillet, melt remaining 1 tablespoon butter over medium-high heat; add pineapple, and cook 2 to 4 minutes, turning once, until pineapple is golden brown on edges. Remove from heat; add rum, and return to heat; cook 1 to 2 minutes over medium-high heat until rum absorbs into mixture. Add sugar; cook 1 to 2 minutes or until sugar melts and begins to caramelize. Pour pineapple mixture over pork. Sprinkle with mint. Serve with lime wedges and rice. Pre-cubed pineapple from the grocery store works just fine in this recipe.